Built by the Morei family in the early 16th century, this historical building is now being transformed into nine luxury residences, four apartments and five penthouses. The developer has teamed up with the best designers and architects such as Stackelberg & Co and GRAS Architects to both preserve the soul and the history of the building but also turn it into high-end homes where every detail matters. 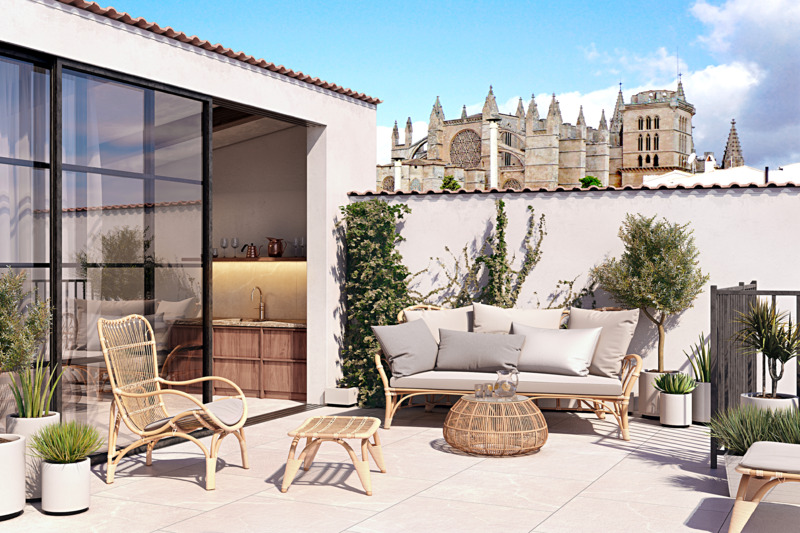 Concierge service, private lifts, roof-terraces, open lofty living- areas, high ceilings with exposed beams, Renaissance features and the most exquisite selection of materials. This is indeed a one of a kind opportunity to acquire your own piece of history in the Old Town of Palma de Mallorca. Please contact us for more information, specification of materials or if you want to schedule in a visit to the site. This Penthouse (nr. 2) is part of the New Development called Pont Vic.